The past month has been a busy one and I admittedly placed the blog on the back burner once again. I have been flooded with med school homework lately and when I am not working on that I am following around my toddler. A few months ago I also started a new commitment to a more healthy lifestyle and began working out again. This commitment to eating clean, organic foods led me to really increase my desire to garden. I went and bought a bunch of organic seeds (to ensure my seeds were never derived from a GMO plant) and started planting. I involved my toddler so she could learn to appreciate living off the land as much as her father and I do. The daily process of watering, pulling weeds, and fertilizing (natural of course) has consumed the extra little bit of time I would normally have for writing. I truly have missed writing but with my new course of healthy eating I really don’t like making sweets since they will be there to tempt me into eating them. To solve my new dilemma I sat awake one night thinking how I could continue the blog in a new direction that would not only fit my current lifestyle but also stay loyal to the readers who already followed. The initial result would be to focus on what used to only be a segment of this blog…the skinny sweets. If I focus on skinny sweets (desserts that are significantly lower in calories and fat and therefore inflicting less guilt when you devour them) then I could continue the blog without the risk of completely spoiling my healthy lifestyle. This was the plan until one day I was gardening with my daughter. While I was pulling weeds, my daughter was watching two blue butterflies swarming around the flowers growing in the yard near our garden. 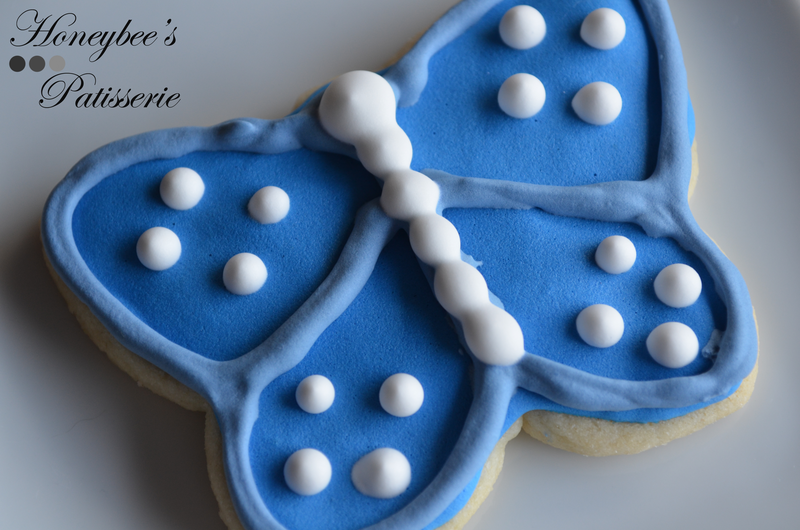 I thought to myself that the butterfly would make a really beautiful cookie. It had been some time since I had made decorated cookies and I began to have an itch for them. Cookies have always been a great way to bring out one’s artistic expression through food. Even children love taking part in them, which means I could have my daughter help me and I would then have more time to bake if she feels like she is involved. This gave me the revelation that I could not only post skinny sweets but also decorated cookies since I absolutely hate the taste and texture of royal icing. With each cookie being covered in royal icing it would keep me from being tempted to eat the cookies and not disrupt my new healthy lifestyle. I know this post is getting more lengthy than usual so I promise to wrap it up soon. I chose to write a lengthy post because I wanted to thoroughly explain to all of my loyal followers the reason for the slight shift in the content of the blog from here on out. For my first post of this kind I decided to make a blue butterfly based off the butterfly that triggered my initial epiphany. 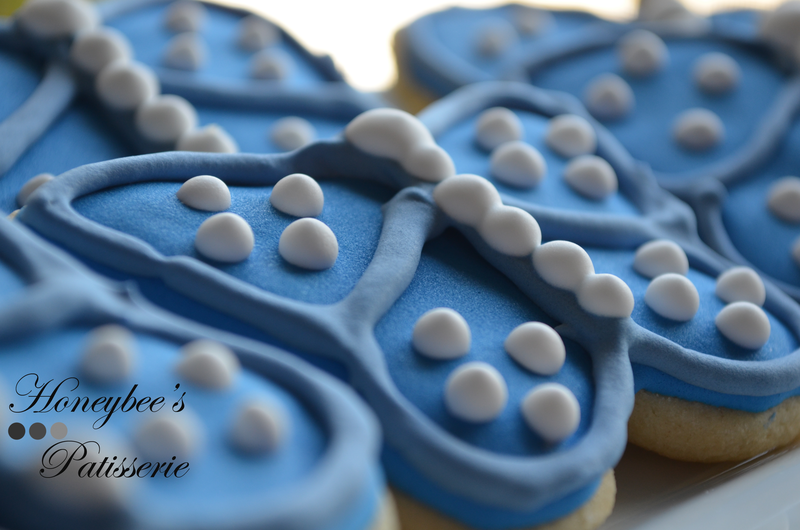 The base is a simple sugar cookie and I dug out an old butterfly cookie cutter I had lying around collecting dust. 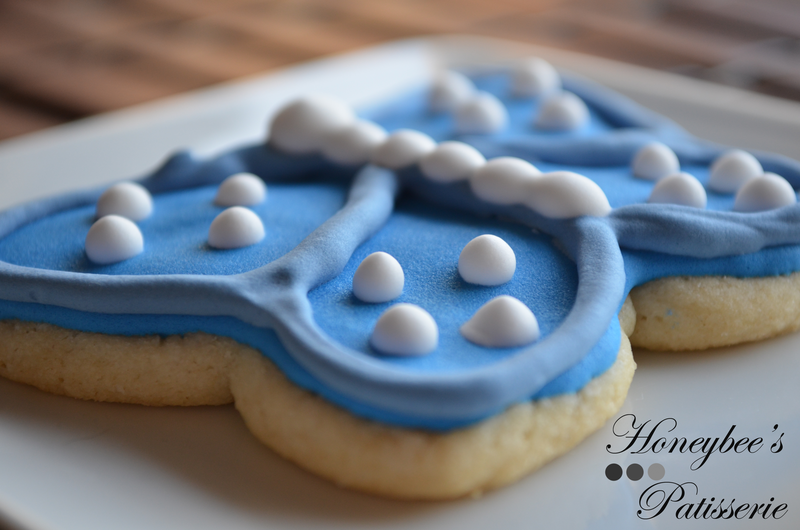 Once the cookies had cooled I prepared a big batch of royal icing (recipe will be provided in a future post). I separated the batch into three portions and colored two of the portions, taking only a little bit from the third portion and saving the rest for a future project. The first portion I tinted with royal blue gel color. Americolor is my favorite brand of gel color but I only had Wilton on hand in the colors I needed so that is what I used. The second portion I tinted with cornflower gel color. I used the royal blue tinted icing as my base color. I outlined and flooded the cookies and allowed them to dry overnight. 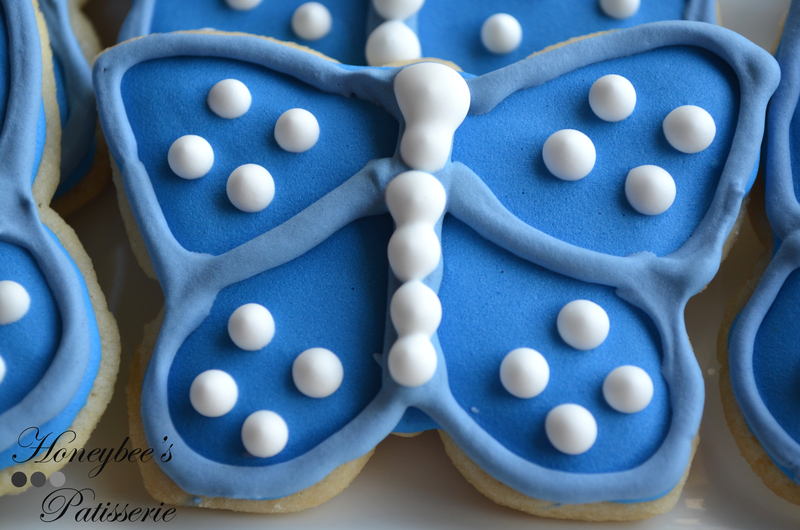 The next day I used the cornflower tinted icing to outline the cookie again and add more details. I also used the white icing to add accents that finished the cookie. 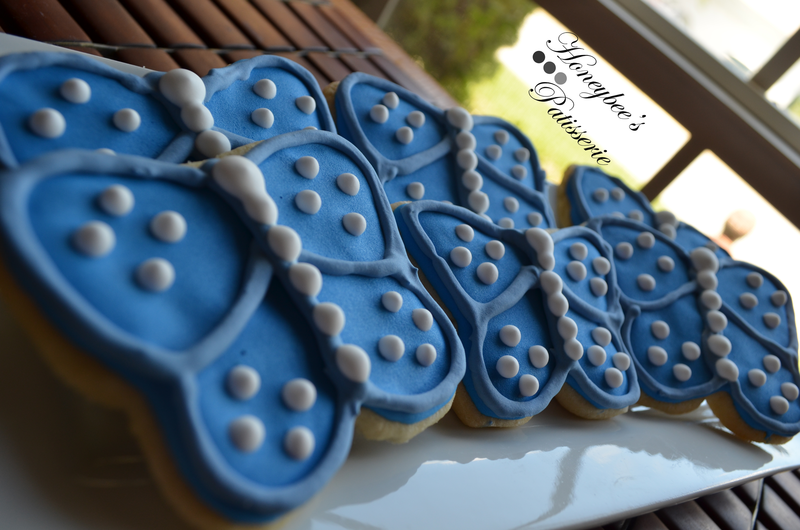 This was a simple design that I made sure wasn’t too complex since it was my first time making these cookies in a long time and I didn’t want to overcomplicate things, especially it would be the first time doing it with my daughter around. All in all I am very happy with how they turned out. I feel they are perfect to serve now as we flutter into the summer months ahead. The blue really sets the tone of summer, similar to the crisp blue, sunny skies.